The purpose of the video was to showcase ShadeFX’s deployable awnings and how they can improve business earnings. Our video shows an inviting cafe patio on a sunny summer afternoon. Once the awning is deployed, the cafe quickly fills up with customers now protected from the sun. 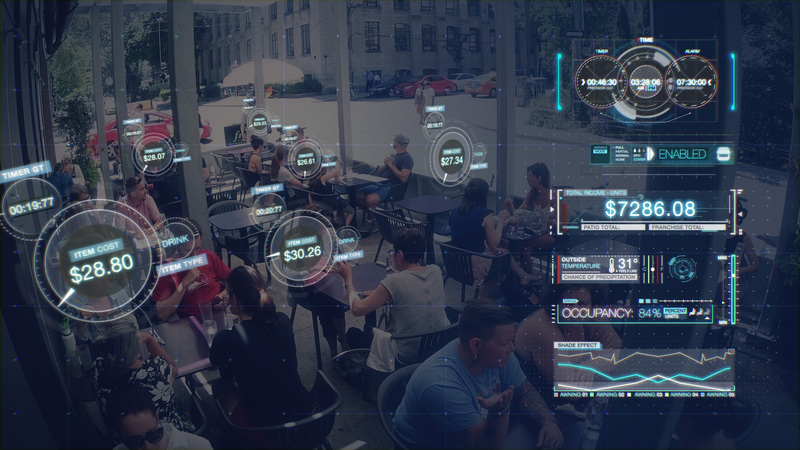 The video features a high-tech modern theme consisting of a holographic hud that connects to various individual circular panels floating above specific customers. The panels track each customer’s purchases and print out their total in sales. On the right side, a larger main hud collects the data and prints out the total income from all customers on the patio. Additional info such as weather details, occupancy, shade effect, graphs and much more adds to the sophisticated hud display. As our video finishes, we receive a final print out of the total earnings made during the day due to the deployed awning. The tag line “Retractable solutions for outdoor spaces” reveals itself. ShadeFX “Awning” was created entirely with After Effects using motion graphics tools. Almost every single element animates itself on as well as off, each offset from one another so as to create dynamic and overlapping animation. Select typographical elements in razor thin typefaces accent the high-tech feel of the video. The live action component was shot by the uber talented Ryan Priest at PixelCarve using time lapse techniques. Since this was shot at 4K video, the resulting video provided enough extra resolution for select cut ins. The video was edited together and colour graded within After Effects Magic Bullet Looks. ShadeFX “Awning” is a perfect example of Hatch Studios’ commitment to sophisticated and dynamic motion graphic and 2D animation techniques.